It seems that NJPTA President elect and We Raise NJ spokeswoman Rose Acerra needs to do her homework on the graduation requirement issue. 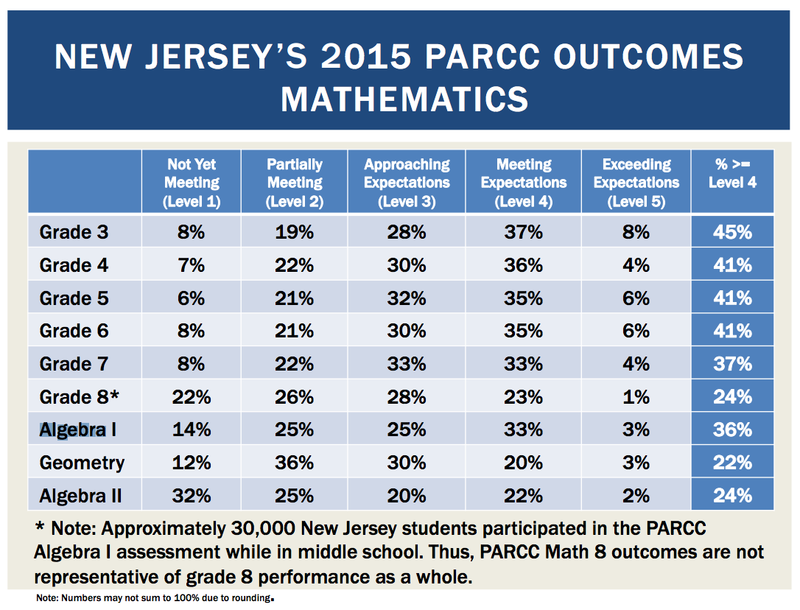 A coalition called We Raise NJ, which includes the New Jersey PTA, NJ Business and Industry Association, NJ Charter Schools Association, NJSBA, and several other groups, sent out a press release yesterday defending PARCC. The only 12th grade students taking exit exams are those students that did not pass the 11th grade administration. Her comments make me wonder if Acerra even understands that the proposed regulations make PARCC Alg 1 and ELA 10 the state's exit exams. And does she understand, for instance, that many students take Algebra 1 in middle school? The state is proposing that schools must pressure middle schoolers and 10th graders (because remember, as of 2020 there will be no opting out) into taking tests with 36% - 37% pass rates to prove they are both "college and career ready" and ready to graduate from high school. As my friend Jersey Jazzman says, is everybody OK with that? Because to my mind, this proposal only makes sense if you want to set kids and schools up to fail. And while Acerra's well rehearsed talking point that the NJ PTA believes in "high-quality standards, as well as assessments that align to those standards," in reality that has nothing to do with the state statute as it relates to graduation exit exams. Did you catch that? 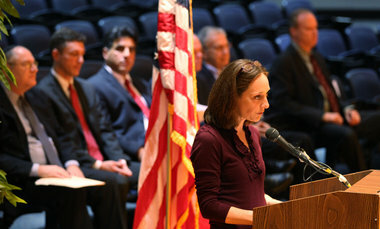 The legislature asked the NJDOE to create a test of basic skills. 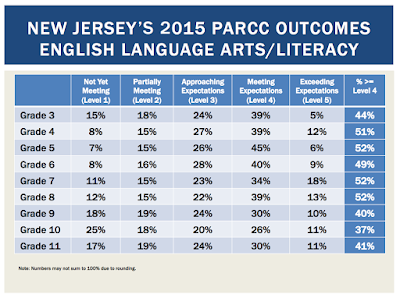 PARCC is not a basic skills test. 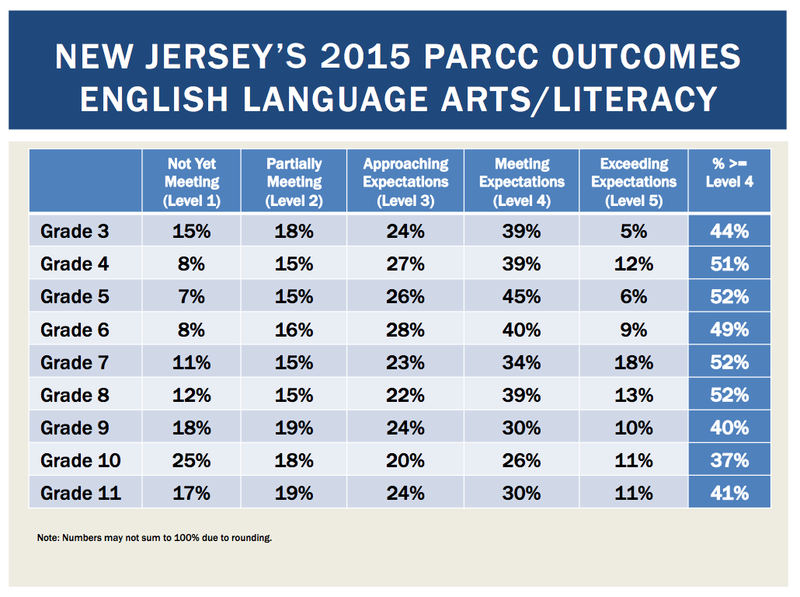 Does PARCC include basic skills? Probably. Is it limited to basic skills? Most certainly not. Shoutout to the brilliant Sarah Tepper Blaine for scouring state statute and making these arguments before the New Jersey State Board of Education yesterday. Her fabulous testimony is posted on her blog. Sarah made it crystal clear that the NJDOE has completely overstepped their authority with the proposed graduation requirement regulations they're asking the state board to adopt. Hey, We Raise New Jersey! I'll see your Rose Acerra and I'll raise you a Sarah Tepper Blaine! You guys may be clever enough to make it look like parents are on board with the NJDOE's proposed changes to graduation requirements by putting the NJPTA out in front on this one, but you don't have parent advocates Sarah. You only have the NJPTA, and they lost the ability to represent the interests of parents the minute the national organization started taking millions of dollars from Bill Gates "to educate parents and communities on the Common Core State Standards." That's when they stopped talking with parents and started talking to them. And while those millions may get Gates a seat at the table in NJ in the form of some made-up coalition of parents and the business community (natural allies, right? ), all that money can't buy him passion, commitment and determination. 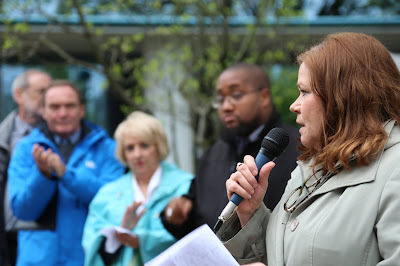 Susan Cauldwell, executive director of SOSNJ Community Organizing, also endorsed the legislative approach during the press conference, but held out the possibility of a grassroots campaign against PARCC that extends into 2017 and beyond. So while We Raise NJ was sending out their crisp press release, SOSNJ, ELC, NJEA and dozens of parents, teachers and students were outside the NJDOE stating our case. We were wet, and we were cold, but we were there to show the powers that be that no single test should be used to decide if a student is eligible to graduate. Especially not a flawed, unreliable, unvalidated instrument such as PARCC - a test that was not designed or intended for this purpose. And like Susan said, we're not going away and change will be coming soon. Excellent commentary and breakdown of the PARCC fiasco as it pertains to NJ law. Thank you for determination to stay the course!